Back in 2007, while visiting San Francisco, I picked up a genuine Dutch cruiser on Craigslist--a white Batavus with Sturmey-Archer three-speed--and rode it all over the city day & night, on several SFBC rides, across the Golden Gate Bridge, to the beach with Critical Manners, etc.. My employer put me up in a nice hotel during the conference, where I worried that management might object to me bringing the bike inside. I didn't need to worry--the day manager and night manager fought each other for dibs on the right to buy the bike off me when I left town. But afterward, when the Zeitgeist (biker bar) told me that I couldn't sleep there, I found lodging one night in a real dive of a hotel before moving to the excellent Elements Hostel in the Mission. San Francisco is famously cool and foggy, but the Mission is an oasis of dry sunshininess. NC-HB 9 "Ban Texting While Driving"
NC-SB 219, "Report Bicycle Crashes to Law Enforcement"
would make more car-bike crashes require a police report by lowering the minimum damage from $1000 to $500 for the bicycle. NC-HB 68 "Prohibited Use of Electronic Devices/Driving"
NC-SB 334 "Department of Transportation Reforms"
seeks to cut a lot of politics out of transportation spending--a goal of our new guv. NC-SB 955 "Bicycle Lights at Night"
The North Carolina Active Transportation Alliance (NCATA) is a fairly new statewide advocacy organization working to improve nonmotorized transportation across NC. NCATA's new Spring 2009 newsletter is now available online at www.ncactive.org and has lots of updates on funding sources, advocacy events and general information about the organization. Download the newsletter and pass it along to friends, colleagues, club members, etc. and consider joining the organization to help support outreach and policy work for human-powered transportation (an individual membership is only $15!!!). maps.google is soliciting suggestions for improvement. You can suggest, "Add trail information to Terrain view" and "Add bike trail information and biking directions"
Curtis, the bike wrench Buddha from CNC's glory days, is back! 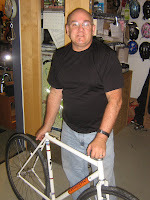 and he is building custom frames! Read about it, and view the snaps, in Branson's article on Research Trailer Park. I guess Five-oh wasn't Mr. C's cup-o-tea?